The Elements: Ether (Space). Air (Wind). In Ayurveda (pronounced eye-your-VAY-duh), when we talk about balance, it’s not confined to work-life balance. We mean an equilibrium that starts with the balance of the elements in our bodies and in our minds. We determine what we need for optimal health by finding out how we are. In our culture, we spend a lot of time seeking who we are. Ayurveda comes at it a different way: how we are. Ayurveda is one of the oldest continuously practiced system of healing in the world. It originated in India 5,000 thousand of years ago. Literally translated, Ayurveda means study or science of life. In the U.S., Ayurveda uses diet and lifestyle to cultivate whole health, not just body health. For Ayurveda, there is no such thing as pure body health. It goes beyond mind-body health as well. For total health, we attend to the body, mind, senses, and soul. It’s all connected. We’re not just talking weight loss or healthy skin. Diet and lifestyle are everything and everything is lifestyle. Work is lifestyle. Love is lifestyle. Rest is lifestyle. Home is lifestyle. How we live is how healthy we are. Even the World Health Organization now concurs with Ayurvedic concepts of health: “The WHO defined health in its broader sense in its 1948 constitution as ‘a state of complete physical, mental, and social well-being and not merely the absence of disease or infirmity’” World Health Organization. The essence of Ayurveda is about instructing people on healthy living in the world. The science of Ayurveda is based on five-elemental theory. We are a reflection of the larger cosmos; all the elements out there are in us as well. The subtlest of the five elements is ether, also known as space. It’s expansive. It’s empty, waiting to be filled. It does not move. Things move into it. Outside, the flora and the fauna move into space. Picture a tree in a dense forest growing into the slivers of space above it or an animal escaping a predator by running into a clearing. Space is clear, subtle, invisible. In our bodies, space is the holes: ears, mouth, nose into the lungs, the GI tract — a giant tube — is the biggest space in our body. As in the outside world, the space in our bodies is just waiting to be filled. Blood moves through the spacious tubes, food through the GI tract. In our minds, it’s the quality of vastness, emptiness, a clearing waiting for new thoughts to move into it. Air is also invisible and subtle. We don’t see it. We see the effects of it. We see the wind move through the trees and the grass. This is also true in our bodies. We know air is present because of the effects of air in our bodies. We recognize air through the effects of speaking, walking, digestion, blinking, belching, heart beating, blood moving, elimination. Picture someone who talks really quickly or really slowly. The talking is the effect of air. The “really quickly” or “really slowly” is the effect of too much air or too little air. In our minds, air functions the same way. We recognize too much air when we feel “air-headed” and absent-minded. We recognize not enough air when we feel clogged and mentally stuck. Going from subtle to more gross down the list, we come to fire. Fire is a physical thing. We see it directly. We cook with it, heat with it. It burns. In our bodies, it functions the same way. Our main digestive fire cooks the food we eat. Fire heats our bodies and keeps us from being popsicles. In our minds, fire heats our thoughts. We recognize too much fire when our minds are excessively sharp or unaccountably angry or intense. We feel dampened fire when we can’t process our emotions or feel unenthusiastic or indifferent about things that would normally be of interest. A core principle of Ayurvedic health comes in with the concept of fire: Digestion. We not only digest the food we eat, but we digest our experiences as well through our senses. Everything we see, hear, smell, taste, and touch is digested for elimination or assimilation. If we don’t process it out, we hold on to it permanently, both bodily and experientially. In the world, water is also a physical thing: oceans, lakes, rivers, dew. Most of our planet is water. In our bodies, it is the same thing. The water element is anything moist or lubricated: saliva, mucous, lymphatic system, fluid in joints, GI tract lined with water/mucous. In our minds, we can feel a water-logged quality to our thinking, sloshy and not mentally sharp. In the world, earth is trees, soil, matter like tables and books. Earth is hard and dense. In our bodies, it’s the actual physical body. Too much earth in our minds presents as heavy thoughts, attachment, greed, mental lethargy. Not enough earth and we’re into spacey, airy thinking. The elements are constantly in flux in our bodies. Too much fire burns up water and earth. The right amount of earth brings grounding in balance for space and air. And so on for every possible combination. Knowing the elements is the foundation of Ayurveda. We are not separate from the world. Even if we work in an office all day, we are never separate. Understanding how our bodies and minds are made up of the same elements as the world around us allows us to understand what each of us needs at any given moment to feel whole and in balance. Ayurveda categorizes our individual, unchangeable constitutions into doshas. Doshas are subtle and invisible, like space and air. We don’t see doshas but rather we know doshas are present because of the effects of doshas on the body. There are three individual doshas (vata, pitta, and kapha) as well as combinations of the three (vata-pitta; vata-kapha, pitta-kapha and so on). Doshas are a specific combination of the elements and which dosha you are identified with depends on how much of each element is dominant in you. When we identify “your dosha” we are identifying which of the elements are naturally dominant in you in your balanced, blissful state. The dominant dosha is your home base, what we are always trying to get back to for balance. Since we all have each of the elements in us, we assess dominant elements to determine our base constitution and when working with imbalances. Once we determine what our natural disposition is, then we can assess which of the elements are most out of balance and being naughty at the moment. All pain, all disease, all health difficulties of any kind can be traced back to the presence or absence of one of more of the elements. I also think of doshas as our superpowers. When our dosha is healthy and balanced, all seems right with the world. We feel invincible. When a pitta is balanced, for instance, they are the most productive, super digesters around. They rule the world and are health powerhouses. When a vata is balanced, for instance, they create unparalleled works of art and spread joy with their mere presence. When a kapha is balanced, they nourish themselves and everyone around them and have the endurance to do so, happily, indefinitely. The literal definition of dosha, though, is “at fault” not “superpower.” When we talk about doshas, we are most often talking about imbalance—which dosha is out of balance. When a dosha gets aggravated, it goes on to aggravate something else like the tissues or organs of the body. When all our systems are working well, then our doshas are at home and in balance. At fault means that when things start to go out of whack, one or more of our doshas are out of balance — too much (usually) or too little. The dosha is at fault in creating the imbalance you are experiencing. If we think of doshas as types, as in body types (or our base personality type), then we can use them as an identification system shorthand to discuss the elemental makeup at each instance of balance and imbalance. We use them to assess how we are supposed to be (balanced) as opposed to how we are at the moment (imbalanced). Vata dosha is made up of the elements ether (space) and air. The qualities of vata dosha, and vata people, are: mobile, dry, light, cold, rough, subtle, and clear. Vatas are almost always cold and are the ones who only need to wash their hair once or twice a week. 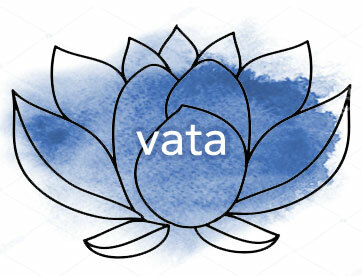 Vatas are light and airy in all ways—physically, mentally, emotionally, and spiritually. They are usually very tall or very short, and lean toward being thin without trying. They are enthusiastic and energetic and changeable. They tend to be easily connected to spiritual and creative pursuits but can also be changeable in those pursuits. A vata imbalance will often present itself in the colon—constipation is an extremely common vata complaint. Vata difficulties will tend to emerge more strongly in the fall and winter because the outside world is filled with vata qualities. Pitta dosha is made up of the elements of fire and water—mostly fire with just enough water so the fire doesn’t burn up the body. The qualities of pitta dosha, and pitta people, are: hot, light, slightly oily, sharp, spreading, and malodorous (yes, our BO is our pitta getting all naughty on us). Pitta people are hot, literally hot. They can be red cheeked and actually hot to the touch. They are often balding and it is said that pitta is so hot it burns the hair right off their heads! Pittas tend to have a penetrating gaze when you’re in a conversation with them. They often have light eyes and are sensitive to light. They have a medium build and are quick to put on muscle if they’re trying. They tend not to have weight fluctuations more than a few pounds for most of their lives. Pitta difficulties will often present in the small intestine and on the skin and reach their height in the summer because of the heat in the outside world. Kapha dosha is made up of the elements of earth and water. The qualities of kapha dosha, and kapha people, are: heavy, slow, cold, stable, soft, oily. Kaphas are usually cold and have to wash their hair daily because of excess oil. Kapha people are naturally bigger physically than their vata and pitta counterparts. They tend to have big, soft eyes and soft faces. They tend to be more sedentary in nature. They are salt of the earth folks, stable and loyal. They are nurturing and friendly. Their elements ground them more than the other doshas. When you mix water and earth, though, you get mud, and because of that, kaphas tend to get stuck more than the other doshas. In their imbalanced state, they hold on — to extra weight, to relationships, to objects in their surroundings. Kapha difficulties reach their height in the spring when the weather outside is damp and muddy. Spring allergies and respiratory issues are common kapha complaints. In the healing system of Ayurveda, “good” is never an adequate answer anymore. Have you always had a delicate digestion? Dry skin and hair? Are you extra tall or extra short and lean naturally toward being very thin? Are you the creative thinker in your circle? When you are stressed, do you tend toward worry or anxious feelings and undereating? If so, you’re probably a vata. Is your skin hot to the touch? Have you been told you have a penetrating gaze? Do you have an iron stomach that can digest anything? Do you emerge naturally as the leader in any impromptu group? When you are stressed and feeling at your worst, do you tend toward angry outbursts or extreme impatience? If so, you’re probably a pitta. Do you have soft, big inviting eyes and soft, supple skin without needing much moisturizer? Do you put on weight easily and lose weight with difficulty? Is it your natural inclination to want to take care of people and animals more so than most people you know? When you are stressed and feeling at your worst, do you tend toward depressive feelings, isolating behaviors, and overeating? If so, you’re probably a kapha. Balancing the doshas is a primary goal of Ayurveda. Knowing what your home base is gives us a place to start. We always want to get you back to home base. It can be simple: Bring more grounding to yourself, for instance, when you feel like you are spinning into the ether and your feet are barely touching the floor. It can also be complex: Knowing which foods are cooling to the hot pitta system, for instance, is not always intuitive given our current food culture. See my Gentle Forward Movement Blog post for a few simple ways to balance. Also, please feel free to book an appointment for a more specific and you-centered assessment.